An Airbnb host in Amsterdam accused of pushing a guest down a flight of stairs for missing her checkout time faces attempted murder charges. Video of the confrontation went viral after the guest’s friend, Zanele Muholi, a popular South African artist and activist, posted it to Instagram on Saturday. The video shows the host, a white male, telling Sibahle Steve Nkumbi, a South African filmmaker and student in Bern, Switzerland, to get out of his rental property. The host then pushes Nkumbi, sending her head-first down a long staircase. She lands at the bottom, face-down and motionless. Nkumbi sustained a concussion, bump to the head and bruises, according to South African news site News24. Amsterdam police arrested the host, who is reportedly 47 years old. Dutch prosectors told Reuters they are considering charging him with attempted murder. Police told South African news site Independent Online that four women had rented the apartment and were due to check out at 11 a.m. on Saturday. The women got into an argument with the Airbnb host over their checkout time around 12:30 p.m. before the confrontation became physical and one woman fell down the stairs, a spokesperson for the Amsterdam police said. Nkumbi was in Amsterdam to write about Muholi’s photography exhibit at the Stedelijk Museum one day earlier. The museum had booked the Airbnb rental for the artists to stay in, according to HuffPost South Africa. 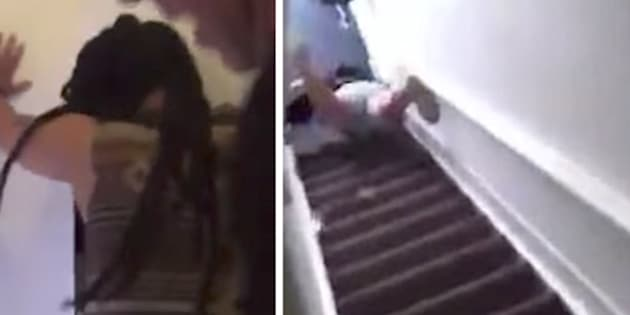 In a YouTube interview with independent journalist Kevin P. Roberson, Nkumbi claimed that the man grabbed her as she was trying to leave the apartment and threw her down the stairs. She also said she believes the confrontation was racially motivated. Sibahle Steve Nkumbi recounted the violent confrontation in a YouTube interview with journalist Kevin P. Roberson. According to Nkumbi, a woman knocked on their rental unit and politely told them that they were late for checkout, saying they had to pack up and leave immediately. Nkumbi said she had “apologized profusely” and asked for a moment to gather their things. “The connection of those words, any person of color that reads this and has been a witness or has witnessed racist attacks, you know it when it happens to you,” Nkumbi said on YouTube. The man pushed Nkumbi as she tried to steady herself on the wall, but eventually she lost grip of the wall and “flew down” the stairs. She passed out from the fall and later woke up in the hospital. Muholi, who filmed the incident, told HuffPost South Africa that she believes the man is racist and a coward. “How does he justify pushing a defenseless woman the way he did?” Muholi said. David King, Airbnb’s director of diversity and belonging, called the incident “appalling and unconscionable” in a statement sent to HuffPost. King and Airbnb CEO Brian Chesky are reaching out to the guests. CORRECTION: An earlier version of this story said the man was charged with attempted murder. Dutch prosecutors told Reuters that they are considering pressing charges, but have not yet done so.